It’s no secret that you will have your fair share of learning, quizzing, remediating and testing in nursing school. One of our favorite tools within the ATI student portal is Learning System. This quiz bank is a great way to practice. Afterall, practice makes perfect. What is Learning System, when should you be using it and how can it help you throughout nursing school? We answer all of those questions, plus more, below. Learning System is a versatile quiz bank that is jam-packed with questions from various content areas. While using Learning System, your comprehension and retention of core nursing school content will be tracked along the way. This will be helpful so you know which areas are your strengths and which areas you have room to improve and remediate. I hear Learning System 3.0 has been released. What’s the difference between this and the older version? You heard correctly! ATI recently updated to Learning System 3.0. This update brings with it adaptive and customized quizzing, plus more questions. In case you are not familiar with adaptive quizzing, it’s a similiar style that is used on the NCLEX exam. Let us explain. Computer adaptive testing selects questions for you to answer based on your response to questions earlier in the test. For example, if you answer an easy question correctly, you will be presented with a harder question later in the exam. But if you answer the easy question incorrectly, you will be presented with another easy question. Tell me about the number of questions and category types I can quiz in. Learning System 3.0 includes over 3,000 unique questions, including alternate format questions, and allows quizzes to be taken in a standard, adaptive or customized mode. 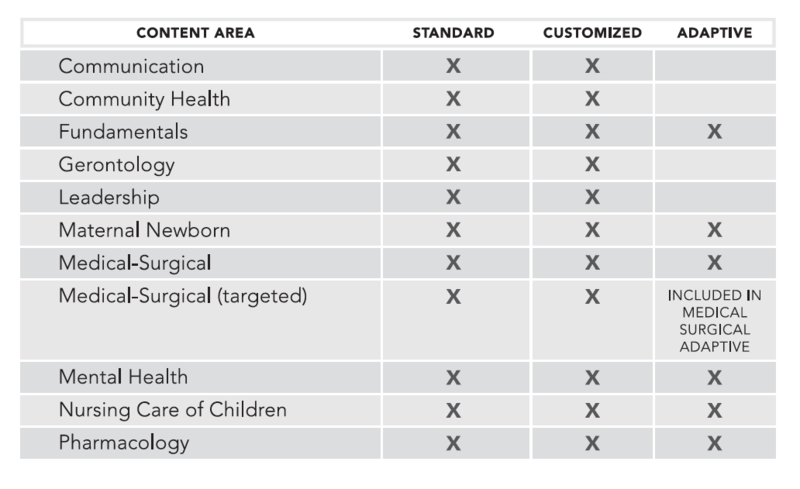 Below is a breakdown of the content areas. When do most students use Learning System 3.0? Nursing students use Learning System 3.0 throughout their nursing school journey. Most commonly, your instructor will assign you a standard quiz or a quiz by content area. Certain quizzes may be locked until you are enrolled in a specific class. Be sure to check with your instructor if you have specific questions about how you will be using Learning System 3.0 throughout nursing school. How will Learning System 3.0 help me throughout nursing school? There are many ways that Learning System 3.0 will help you throughout nursing school. Added Practice: This one is a biggie! Sometimes it seems as though there are not enough practice questions to prepare you for your next ATI exam or even the NCLEX. Learning System will allow you that added practice in so many formats. Practice in a Timed Environment: Timed testing can be nerve wracking for many students. This tool will allow you to truly practice in a setting that is similar to test day – timed and without rationales. If timed testing is something that you struggle with, check out this article, Test Anxiety? Here’s How to Handle a Timed Exam. Practice in an Adaptive Environment: Like we mentioned above, the NCLEX exam takes place in an adaptive testing environment, adapting to the way you answer questions throughout the exam. Practicing this style of testing on the content you need to know during school will help you prepare for the future. Opportunity to Build Quizzes: Learning System 3.0 will provide you the opportunity to build quizzes in various categories, allowing you to remediate in specific content areas. Ready to get started? You can find Learning System 3.0 in the Test tab of the ATI student portal.